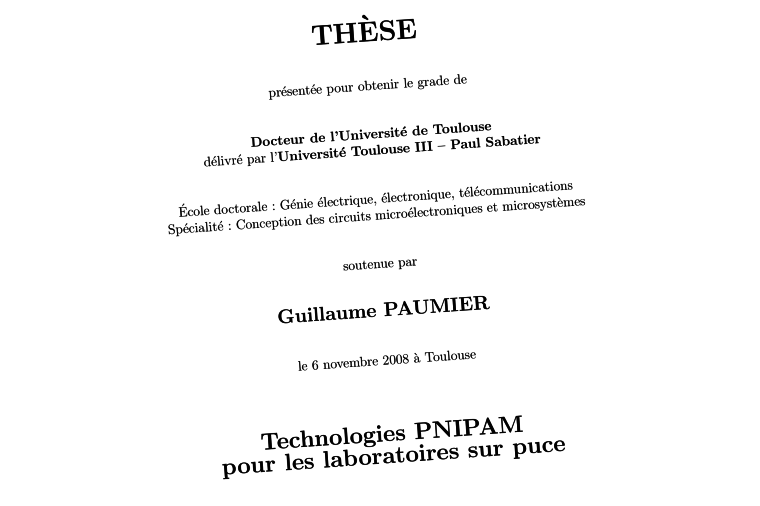 I am glad to announce that my Ph.D thesis, entitled Technologies PNIPAM pour les laboratoires sur puce (“PNIPAM technologies for labs-on-chips”), is now available for download. 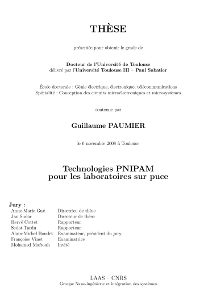 The document is only available in French (per University policy), but there are some pretty pictures and infographics in there too for people who don't speak French; one of them is the "Interdisciplinarity, biology and micro-nanotechnologies" information graphics I published earlier. Labs on chips are miniaturized devices integrating one or several laboratory functions, usually dedicated to the handling of chemical and biological samples. Our work aimed at integrating a smart polymer called poly(N-isopropylacrylamide) (PNIPAM) in microsystems, in order to develop a new technological process for labs on chips. PNIPAM is a thermosensitive polymer that undergoes a reversible state transition; it switches from a hydrophilic, swollen state below its temperature of transition (LCST ~ 32°C), to a hydrophobic, collapsed state above it. The technology we developed is based on heating elements and a surface functionalization process to graft the PNIPAM layer. Our results show that the electro-osmotic flow can be modulated by thermally controlling the PNIPAM, thus paving the way to electrokinetic mixers. This thermal control also enables the adsorption (and partial desorption) of proteins on fonctionalized beads, the main application being sample preparation. Keywords: Lab on a chip, NIPAM, microfluidics, thermosensitive polymer. I mainly used LaTeX to create this document. All vector infographics were made using Inkscape. Although the PDF file can be searched as plain text, I have also started to convert the document to wikitext in order to make the whole content available on Wikisource. However, this process takes time and I have other priorities at the moment, so any help is welcome in the meantime. I released the whole document under a GNU free documentation license, which means you are free to use it, modify it, redistribute it for any purpose as long as you appropriately attribute it, and that you distribute any derivative works only under the same license. You also have to provide a copy of the license.